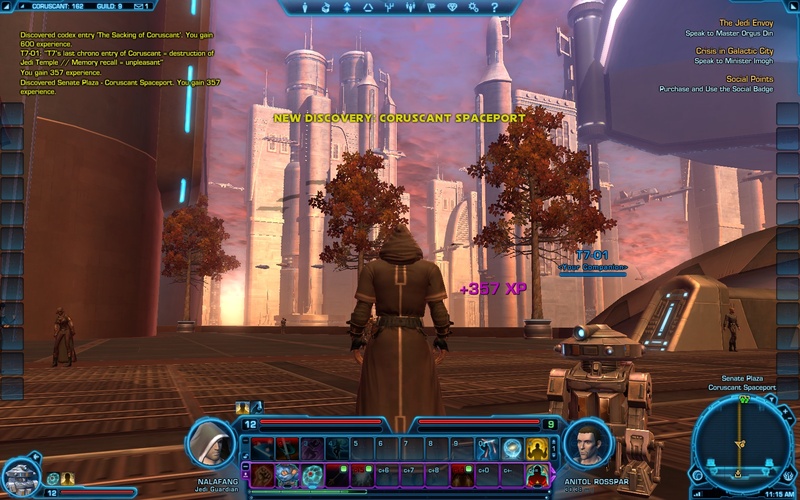 The Refined Geek » Star Wars The Old Republic: An Engrossing, Well Polished MMORPG. Star Wars The Old Republic: An Engrossing, Well Polished MMORPG. I’ve played my fair share of Star Wars games over the years. I can remember playing one on my trusty Nintendo Entertainment System which was just your basic platformer but was still enough to keep me captivated way back then (I was 6 at the time). More recently I indulged in the Jedi Knight Academy series of games which, to their credit, were actually quite fun and had a half decent story about them. I did not however get into Star Wars Galaxies, having heard how atrocious it was. Star Wars: The Old Republic however caught my attention from the get go mostly because BioWare was going to be the one developing it. I’ve always enjoyed their RPGs so it follows that their MMORPGs should be no different. Thus I pre-ordered my collector’s edition from Amazon months ago and I’ve been playing it ever since. SW:TOR puts you 300 years after the events that occurred in the single player game Knights of the Old Republic which is still some 3,500 years prior to the events that take place in the original Star Wars movies. The Sith have returned in full force, retaking their old home of Korriban and re-establishing their Sith order. You then get to decide which faction to play for, The Republic or The Empire, and your choice will drastically change the story that unfolds before you. 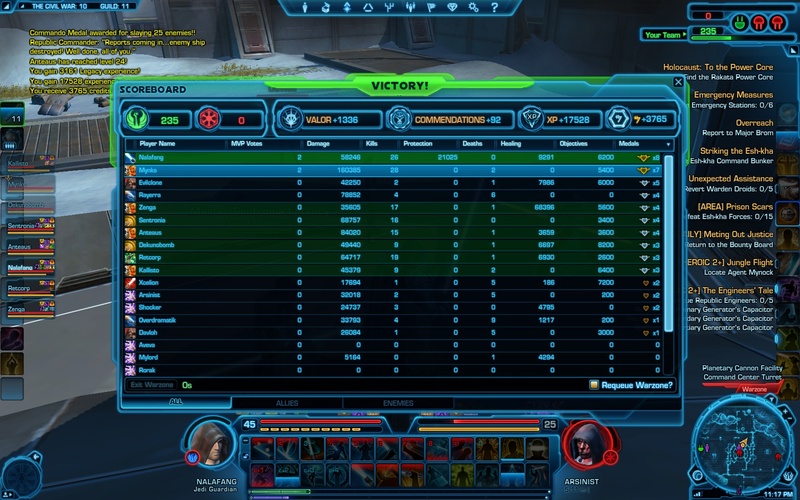 For reference I was a Jedi Knight base class and choose the Guardian specialization, putting me as a tank/dps. Your choice of advanced class doesn’t appear to influence the story however, just the archetype role you’ll fill. Character customization is definitely a step above what I’m normally used to seeing in a MMORPG but is still somewhat lower than what you usually find in traditional RPGs. Most of the choices are from pre-set options so whilst it’s unlikely that you’ll find 2 characters that are completely identical there’s a very good chance you’ll notice someone running around with your face at one point, leading to some rather awkward moments. Still there’s enough variation in both your base character model as well as armour types to ensure that you won’t feel like you’re playing in a clone army. On first impression the graphics of SW:TOR are nothing to write home about, especially when compared to the stunning visuals of some recent RPGs. Still much like World of Warcraft the stylization that has been used throughout the game means that it doesn’t detract from the experience. Of course, as with any MMORPG, graphics usually have to be stepped down in order to cope with the potential for huge numbers of players to be on screen at any one time. Indeed I’ve experienced some slowdown in the more populated areas (<30 people) but for the most part the graphics are the right balance of pretty and performance. 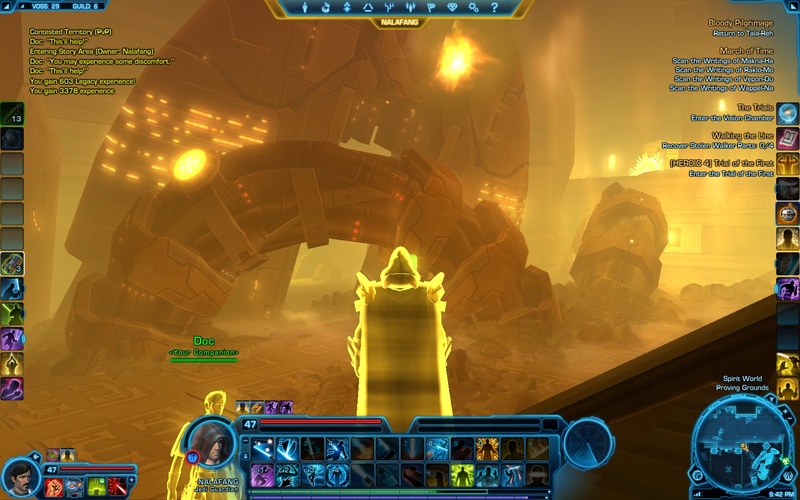 All that being said however some of the environments that are set up within SW:TOR did trigger my sense of awe. The screenshot above was just the first such example of where I stopped in my tracks and just took in the world for a while. It really did make me feel like I was part of something much greater than myself, something where the scale was far beyond just what was being presented to me at the time. However it would all be just simple eye candy if it weren’t for the story that underpins your entire reason for existing in this vast universe. Now for most traditional MMORPGs the idea of an over-arching story line usually only goes as far as one particular level bracket. I can remember this quite clearly from my time with World of Warcraft where each area would have its own unique story but the connections between them were either tenuous or non-existent. SW:TOR on the other hand has a series of class quests that are in essence the driver for you to go from one planet to another. They’re far from a simple advancement device though as there are many times when you’ll be whisked away from the known planets on your map to other locations, sometimes for hours at a time. Indeed SW:TOR could very easily be played as a single player RPG for those who’d like another fix of Star Wars goodness but were turned off by the MMORPG title. Sure there’s no escaping the fact that there’s countless “Kill X enemies” or “Gather Y of Z item” kinds of mission in there but should you not be too concerned with levelling as fast as you can they can be, for the most part, skipped entirely. A good chunk of the missions have some kind of unique mechanic or are broken up by enough cut scenes to make them feel a lot less grindy than their counterparts in other MMORPGs. Indeed there were times when I was playing simply because the story was driving me to, not the urge to get to max level and start gearing my character. I can honestly say I’ve never had that in a MMORPG before. Levelling is actually quite enjoyable and doesn’t feel like a barrier to the real meat of SW:TOR. Unlike most MMORPGs where getting max level takes months of herculean effort you can easily reach max level in around 3 to 4 days played if you put your mind to it. My trip to max level was decidedly more leisurely but even I was able to knock out a max level character in under a month of play. This again reinforces the idea that SW:TOR would in fact make a great single player game that you could play through and be done with afterwards. That is, of course, how they’ll hook you in but I’ll be damned if it isn’t true. 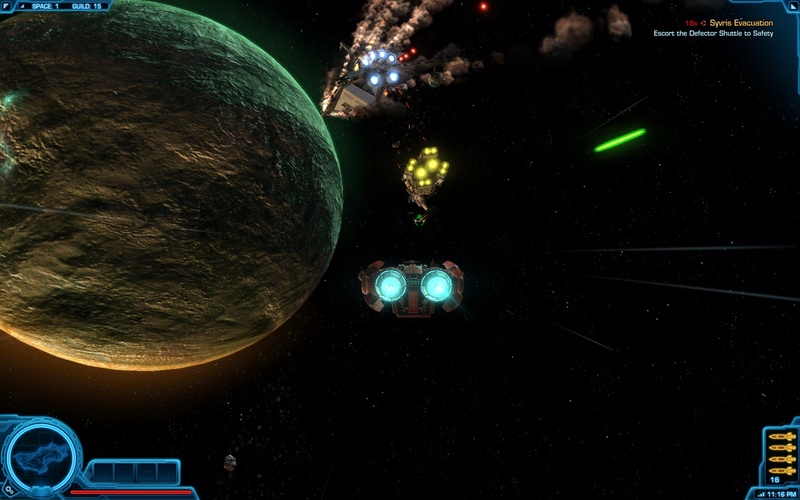 The space missions also serve as a nice break from the usual tedium of questing. They’re something of a point and click adventure with the camera running along a set path with you being free to move around inside it. Initially they’re a walk in the park, especially for experienced gamers, but as you progress there will be ones that will challenge you. Like most things though you’ll eventually overcome the challenge and you’ll have to wait until you pass a certain level before you get another challenging one, but they’re still refreshing if you’ve been questing endlessly for a couple hours. Your space ship also functions as a melting pot for you and your companions as well as being your transport between questing areas. I think this is probably why the questing in SW:TOR felt so fluid as each planet has a specific level bracket and could be travelled to with very little hassle. It also meant there weren’t any strange transition areas like there are in other MMORPGs when the designers tried to meld say a vast desert with a dense jungle (think Desolace to Feralas in WoW). It’s also quite nice to have the external camp to interact with your companions as their story lines (and potential romances) are quite interesting in themselves. The experience however is not exactly trouble free. Shown above are two common glitches that I would routinely encounter, the one on the left moreseo than the right. There are quite a few graphical glitches that crop up from time to time but thankfully none of them too severe and are usually temporary. The second one shown above is a more extreme (but hilarious) example of the camera angles for cut scenes going all whacky and sometimes glitching out you or your NPCs armour. Mostly it would be my cape being stuck in my torso, but there’s also been people missing, voice overs not playing and characters not moving their mouths when talking. There’s also some issues with lag, but not the ones you’d think. Even though BioWare didn’t release SW:TOR in Australia because of lag concerns I routinely get sub 200ms pings to the server, better even than I got in World of Warcraft (before I started using a tunnel, though). However there were still a few occasions when the server and my client would get out of sync, sending my character into a flurry of stepping forward only to be slingshot back. This would continue for up to 30 seconds at a time making for some rather frustrating moments. PVP is something of a mixed bag at the moment thanks to the end game version of it still being a work in progress. You can participate in PVP from level 10 and currently everyone is thrown into the same bracket together. Everyone’s stats are boosted up to the highest level participant however so you can be somewhat competitive even when you’re just starting out. There are 3 different scenarios (capture and hold, timed race to the end and, in essence, football) so there’s not a whole lot of variety and it does start to feel repetitive after an hour or so. Still you’ll receive credits, experience and tokens towards PVP gear for participating so it’s well worth doing them, even if PVP doesn’t interest you at all. The end game PVP appears to be an attempt to copy the ideas that Warhammer: Age of Reckoning brought to the table with Realm vs Realm PVP. There’s one world called Illum that’s basically up for grabs for either side should they want to have it. You can capture it by holding objectives although it’s not entirely clear what you get for doing so. This would be great except that currently open world PVP doesn’t award valor (PVP rank points) and there doesn’t appear to be any kind of bonus for holding Illum. Thus the end game PVP is reduced to people sitting at the objectives long enough to complete their dailies and then leaving, usually not even attempting to engage each other. I won’t complain about the free loot but it does feel somewhat pointless as there’s no reason to be there than for the dailies. Compared to other recent MMORPG launches Star Wars: The Old Republic really stands out as one where the developers did their homework and worked hard to deliver an experience that was on par with those that were currently on offer. Sure its not as complete or as polished as others are now but for a first release it’s actually quite phenomenal, easily beating the initial release experience I’ve had with nearly all other MMORPGs. There’s still a lot of things where they could improve but overall the current game is more than enough to cement their position as a solid contender and I can see myself continuing to play it for a good couple months after this review. The question many people ask is though, will this take the crown as MMORPG king away from World of Warcraft? I don’t think it will, but not because of any fault with the game itself. All the other WoW killers out there were fundamentally flawed at launch, usually lacking content or sufficient polish. World of Warcraft is the opiate for the MMORPG masses and the only ones capable of taking it down are Blizzard themselves and indeed it looks like they will with Diablo III and the mysterious Project Titan. SW:TOR however is a strong contender to be second place to them, and not just the distant second that many have been before it. 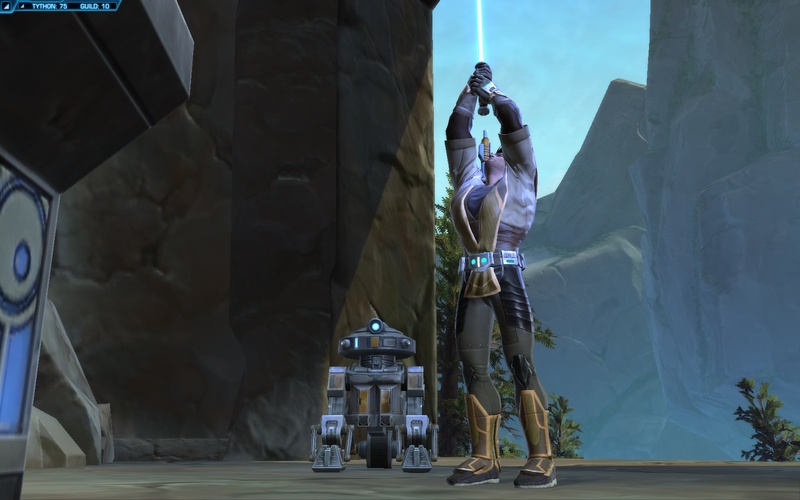 Star Wars: The Old Republic managed to re-ignite that same sense of passion, wonder and fulfilment that I first felt all those years ago when I made my first tenuous steps into the world of MMORPGs. It really is a wonderful feeling going through a new world for the first time, especially one that’s as rich as SW:TOR. I can’t see myself getting as addicted as I did back in my MMORPG heydays but that’s probably just me getting older more than it is the game being any less addictive. For Star Wars fans, MMORPGers and RPG fans alike SW:TOR is definitely worth checking out, even if you ignore that whole online part. Star Wars: The Old Republic is available right on exclusively on PC for $62 which includes 1 month of game time. Game was played entirely on PC with around 5 days (120 hours) of total play time and reaching the level cap, 50. Pingback: The Refined Geek » The Time to Max Level Question. Pingback: The Refined Geek » Bastion: The Calamity Was a Hell of a Thing.